Modeled after Eastern and African swords that feature an inward curving blade, this Cobra Steel Talon Knife is an effective little blade that is as at home in the brush as it is in the forests, and in a pinch, it is also a great self-defense knife. Its name is also very-well deserved, as the knife features a shape that is eerily similar to the claws and talons of countless creatures, as well as possessing a shape that is not too far off from a cobras venomous fang. 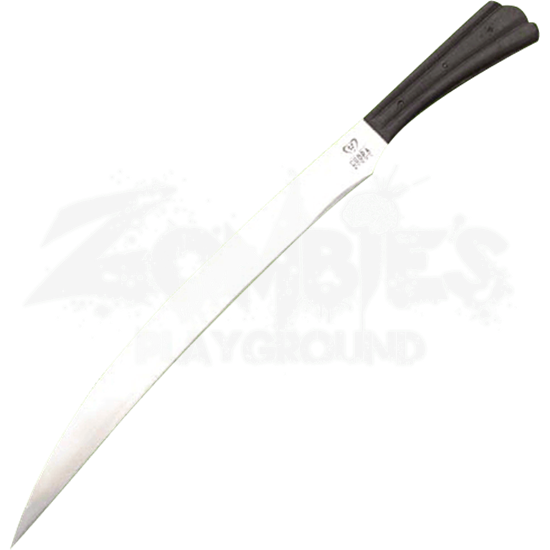 The effect is that this knife is a rather useful stabbing tool, although its inward curved edge will also deliver long, painful slices and slashes, too. The blade is hand forged from 1095 high carbon steel that has been fully tempered to possess both extreme strength and extreme flexibility, allowing this blade to flex, bend, and then spring right back into action. The blade also features a full-tang construction, further enhancing its already considerable strength, while the grip, which is made up of hardened rubber scales, provides a good, solid grip that practically molds itself into your hand. The blade comes with a tough, saddle grade leather belt sheath, as well as featuring a factory-sharpened edge that is impressively keen. The blade measures approximately 15 inches long, while the knifes overall length is closer to 21 inches. If you are looking for a unique blade that will see you through the good and the bad without ever faltering, then you have found just that in this Cobra Steel Talon Knife.